Following the summons of the Supreme Pontiff, Benedict XVI, to pray for peace in the Middle East, the Archdiocese of Manila has enjoined all priests and communities that special prayers be said in all Masses until order is restored in the places afflicted by war. The Holy Father has also declared Sunday, July 23 as a day of prayer and penance for peace in the Middle East. Below are the 'special prayers' issued by the Commission on Liturgy of the Catholic Bishop's Conference of the Philippines (CBCP). We pray for peace in the Middle East, especially in the Holy Land and Lebanon. May the governments at war with each other come to realize that nobody wins in war and that peace is the only way to genuine community of humankind. We pray to the Lord. We pray for those who are suffering and grieving because of this conflict of powers in the Holy Land and Lebanon, that they may continue to hold on to the power of love and peace rather than the destruction of hatred and vengeance. We pray to the Lord. Para sa kapayapaan sa Gitnang Silangan lalo na sa Holy Land at Lebanon. Biyayaan nawa ang mga pamahalaan ng nakikipagdigmaan sa isa’t isa ng maunawaan na walang nagwawagi sa digmaan at gawin nila ang lahat tungo sa pagtatatag ng kapayapaan sa isa’t isa. Manalangin tayo sa Panginoon. Para sa lahat ng naghihirap at namimighati bunga ng digmaan sa mundo lalo na sa Holy Land at Lebanon, upang ang Espiritu ng pag-ibig at pagpapatawad ang magpatatag sa kanila. Manalangin tayo sa Panginoon. For more about the circular, visit the official website of the Archdiocese of Manila. For an alternative formula from this blog, click here. Today we honor Saint Mary Magdalene, a largely confused and misunderstood figure. The Benedictine Ordo even found it necessary to clarify in its July 21 entry: "Tomorrow's celebration honours only Mary Magdalene to whom the Lord first appeared after his resurrection, not the sister of Lazarus and Martha nor the sinner of Lk 7:36-50." Even after the sensational publishing and filming of The Da Vinci Code put her again on the spot(light), she remains little known and poorly appreciated, if not more often intrigued or trivialized. But Mary is such an important and meaningful figure in the Gospels. She is numbered among those who remained at the foot of the Cross. She was also among the women disciples who went early on the morning after the Sabbath to anoint the body of the Lord to whom a young man appeared and bid them go and tell the disciples about the Good News of the resurrection. According to John, she is the one to whom the Risen Lord first appeared. Fittingly so. She was not among the Lord's privileged Twelve, nor was she his mother or relative, but she remained at the Lord's side and accompanied him to his bitter end. At the first opportunity, she dared go to honor the body of the Lord despite the great danger that forced the other disciples to hide in fear. Realizing that the body of her Lord was taken away, she wept so profusely that when two angels were not enough to console her, the Lord himself came to bring joy to her sorrow. Mary did not recognize the Lord at first. But recognizing him, she exclaimed "Rabbouni!" and went to embrace him. Mary was a woman of great love. In traditional iconography, she is always portrayed wearing the red robes that signify love. She also bears an important message: The Lord is Risen and has appeared to her; one who has deeply and intimately encountered the Risen Lord who raised her from her grief to become 'apostle to the apostles'. She encountered the Risen Lord but only after sharing in his suffering and death that made her experience fully and profoundly the mystery of the Resurrection with her love that has endured the test of fidelity. And so let us pray on this memorial of Saint Mary Magdalene that we may have some share in her great love: that we may persevere with the Lord in his suffering and death, to truly share in his Easter joy. Feeling Mo Lang o Feeling Ko Lang? In today’s Gospel, the Lord makes three daring assertions about himself: he is refreshing; he is gentle and humble; his yoke is easy and his burden light. Yes, the Lord is refreshing. During retreat and recollections. Recollections when we sleep much and pray little. Retreats when we bask in the beauty of nature and take a break from our worries and problems for at least five quiet days. But after a long and tiring day of academic work, lectures and quizzes, assignments and group work, come dishwashing and light cleaning, or else, a two hour talk about PC Maintenance, or even the enjoyable but rather tiring grinding and belly-dancing sessions with Jim (a la Shakira), and still more papers and readings to do after all that, one cannot help, I cannot help but find myself in bed at last, dead tired and really exhausted. Lantang gulay. 2. He is gentle and humble. Yes, the Lord is gentle and humble. When days come and every prayer is answered. When God feels really close like a true friend beside you and making things easier for you. Talk about gentle and humble. 3. His yoke is easy and his burden, light. Yes, his yoke is easy and his burden light. But only if you like what is being asked of you. When it is liturgy, or haustus, or recreation, or the more special recreation like picking at Earl or Jim or Ken Habana, this is really easy. God doesn’t even have to order and if he does I can readily say, “Sure! Why not?” Even in the middle of the night. But how about manualia, or dishwashing, the long and seemingly endless powwow, or having to go to class when it is raining and it feels so good to sleep? Talk about an easy yoke and a light burden. Baka naman feeling mo lang yan? Lord, baka naman feeling mo lang yan? Akala mo refreshing ka, gentle and humble, that your yoke is easy and your burden light? In the first reading Isaiah complains: “We conceived and writhed in pain, giving birth to wind; salvation we have not achieved in the earth, the world’s inhabitants cannot bring it forth.” Ginawa ko na ang lahat, binigay ko na ang lahat, Duh! pigang-piga na ako, pero wala pa rin, and worse, wala ka pa. O my God! But Isaiah begins by asserting that the Lord makes the way of the just smooth and level. Saint Therese tells us about her famous ‘elevator’: how she found herself as a little child, struggling to go up a ladder to be able to reach Jesus. Of course, she could not, with her short and feeble feet. Yet at last, when she learned to let go, the Lord himself came to pick her up and carry her all the way to the top with his big and strong arms. How much of our demands is really his demand? How much of our exhausted energies is really spent for him? Is this burden we are carrying really his, or ours? Baka naman feeling ko lang ito? Feel na feel kong magpakapagod kaya ako nalalantang gulay? Feeling close ako kay Jesus kaya dapat sulpot agad siya kapag tinawag ko? Yung feeling ko lang ang gusto ko at kapag hindi ko na feel ang hinihingi, ayaw ko na. In this difficult time of war and conflict, let us pray to our Father in heaven who created us in love and made us, as his children in Christ, brothers and sisters to one another. 1. That the Holy Church, under the leadership of our Holy Father, Pope Benedict XVI, may steadfastly call on nations to the path of peace and reconciliation and lead in efforts to engage conflicting parties in sincere dialogue. Let us pray to the Lord. 2. For all world leaders, that they may work together to restore harmony and order in places afflicted by war and violence and come to rescue and relieve those who are caught in the midst of conflict. Let us pray to the Lord. 3. For Israel, Lebanon and Palestine, that they may learn to transcend their pride and hurt for the sake of their people and walk with each other along the path of forgiveness, openness and solidarity. Let us pray to the Lord. 4. For all who are caught in the middle of conflict, especially the children, the poor and the helpless. That the charity of believers and non-believers alike, and their hope and faith in the mercy of God, may be a source of strength and consolation for them. Let us pray to the Lord. 5. For all of us here gathered, that we may continue to pray for peace and live as peacemakers in our own families and communities. Let us pray to the Lord. through the arms of Christ raised on the Cross. and come to the aid of those in need. and guide our feet on the way to peace. 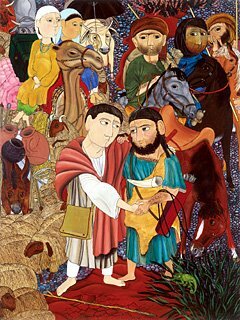 In this difficult time when violence and hatred intensifies anew in the Middle East, let us join all humanity in prayer that this part of the world from which came Christ, our Peace, may see the end of armed conflict and find true and lasting reconciliation. City of Rulers and Prophets. Jerusalem: God's City, God's House, God's Joy. "Let us go to the Lord's house!" we stand inside your gates. that city and temple are one. every tribe of the Lord. the thrones of David's line. peace in your great houses. I say, "Peace be with you!" The memorial of Our Lady of Mount Carmel is omitted this year because it falls on a Sunday. But for us who are especially devoted to Our Lady's Scapular, today remains a special day to celebrate Our Mother's gift. The story goes that the Order of Carmel was then undergoing a severe crisis following their flight from the Holy Land after it was occupied by the Moors. The hermits wanted to keep intact their way of living in the desert, but many also wanted to adapt to the new situation they were in and the group was beginning to tear apart. 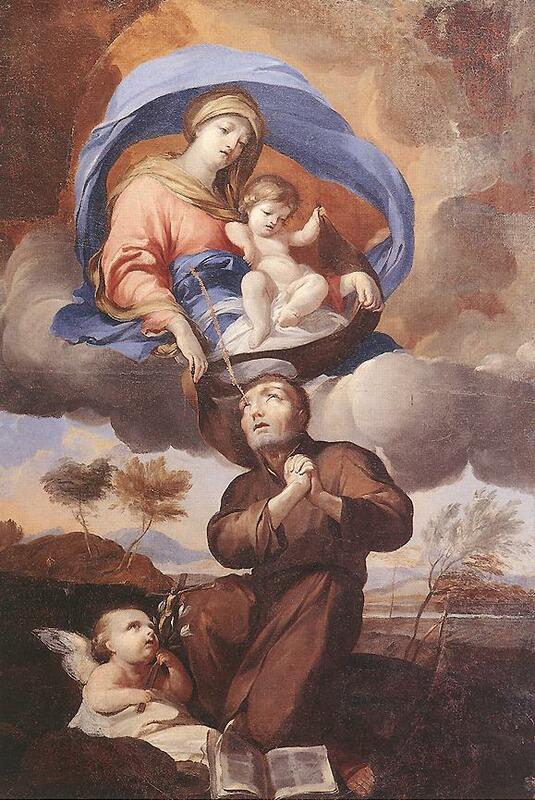 Saint Simon Stock, then at the helm of the order, was desperate and in his great anguish burst forth in a cry to the Mother of God: “Flower of Carmel, blossoming vine, splendor of heaven…”—the poignant and beautiful hymn Flos Carmeli that we still sing even today. At this most trying moment, Our Lady appeared to him and gave him a scapular, a garment commonly worn for protection. It is a badge of her favor and patronage, she said, an assurance even that “whosoever dies wearing this scapular shall suffer not eternal fire.” Our Lady's keepsake sustained Carmel during these difficult times, and many others who have since accepted this badge as Our Lady's gift to them as well. A keepsake is a token, a small representation of what is infinitely bigger than the thing that is given to us. In the liturgy of marriage, there is a rite where the groom presents to the bride the arrhae or some other material symbol. The groom in fact is giving to the bride, not just a string of coins, but he is entrusting her with all that he has, and indeed his very self. When a lover gives his or her sweetheart a keepsake, what it actually means is that he or she is giving his or herself for the beloved to treasure and to cherish, to always keep close to the heart. It also means that the lover always keeps the one who receives the token in his or her own heart. There is a promise of protection in a keepsake, an assurance that despite physical barriers, there is a love that reaches out to us wherever we are. A keepsake comes with a promise of spiritual fellowship, of constant prayer and support. When somebody is going away for a long time, we give keepsakes to remind him or her that we are always behind him or her wherever he or she may go. When we look at keepsakes during difficult times, we find strength, consolation and comfort as if we actually touch the presence of the giver. Finally, a keepsake is a constant invitation to return home. When her child leaves home for the first time, probably on the first day of school, a mother prepares a sandwich or gives a little toy to assure the child that there is nothing to fear since even if he or she will be far from her for a brief period of time, there will always be a homecoming when there will be infinitely more sandwiches and toys. Whenever we notice the keepsake that we sometimes put away or forget to appreciate, we are reminded that there is someone expecting us, that there are loving arms waiting to embrace us. Whenever I think of the scapular, I am always reminded of the passage from Isaiah in which the Church also sees Our Lady: “The Lord has clothed me with a robe of salvation, wrapped me in a mantle of justice.” The scapular cloth is not just Our Lady’s mantle but the brooding wings of Our Father who is like a mother eagle sheltering us. If we put this on spiritually and not just physically, then we can be sure to experience the Lord’s love and protection, and if we will let ourselves be, led safely home. In today's Gospel, Jesus strictly instructs his disciples whom he is sending to preach the Kingdom, to bring nothing along, but allows them to bring 'but a walking stick'. For people like them who are strong and vigorous, a walking stick may not mean so much. But when they begin to tire and weary, whether bodily or in the heart, then the walking stick serves as a pillar of support, a source of comfort, a constant reminder that they are not alone. On this day we remember Our Lady, and ultimately Our Lord, who gives us through her in the scapular of Carmel, a keepsake of love and care, a walking stick to bring along on our pilgrim way. SAINT BONAVENTURE, whom we honor today, was a great leader and reconciler in the Church. As a scholar trained in the Neo-Platonic tradition of Saint Augustine, he had to contend with the reintroduction of the Aristotelian corpus. As Minister-General of the Franciscans, he had to mediate between the Zelati, who were fastidious about the strict observance of the Rule and the Relaxati, who were impatient about introducing reforms and mitigations. While some may contrast him against Saint Thomas Aquinas, with whom he disputed on so many matters but who nevertheless remained his good friend, as an adamant disciple of Plato and Augustine who refused to accommodate the newly-found Aristotelian teachings, he nevertheless maintained an open mind and is even known to have quoted Aristotle more than any of the scholastics. Placed at the helm of his order in such a difficult time that threatened its stability if not survival, he unified his brethren by subduing both extremes and finding a middle way that preserved tradition and at the same time adapted changes that were for the better, such as sending the friars to study in the universities. Bonaventure teaches us how to confront crises that challenge our convictions and oblige us to make crucial choices. What perhaps allowed him, otherwise a scholar comfortable in his system and an academic already well-placed in his career, to take up and face the challenges that met him was his great faith. Always, in all his discourses and all decisions, the Doctor Devotus turned to the Lord for enlightenment and guidance and did not rely on his own knowledge and competence. In the first reading, we contemplate with the prophet Jeremiah a vision of God enthroned upon the Seraphim and confront our own unworthiness before God and his gracious election. Is this not the same humility of the Seraphic Doctor Bonaventure, who, although gifted with a brilliant intellect and a great capacity for leadership, never regarded his own opinion as apodictic truth and saw himself only as "a poor compiler"? Who, although a pillar of strength as a leader was also one who listened and knew intimately the struggles of his own as a shepherd? Indeed, Bonaventure was Seraphic because he was one who was glorious yet knew how to cover himself before God's glory: a disciple below his true Master; a leader of his brethren but first, a servant of his Lord. And yet, with this humility, he also bore an amazing confidence that allowed him to face the many trials that beset him and his times with remarkable clarity and unperturbed composure. In today's Gospel, Jesus calls on us to have the same confidence, founded on a living relationship with him that dispels all our fear and anxiety and allows us to recognize and acknowledge him, even in the face of confusion and in the midst of crisis both within and without us. As we remember this great teacher and leader of the Church, let us ask for the mind and heart of Bonaventure, that we may always be open to listen to others and open to listen to the Lord. Lord, come to our aid. 1. 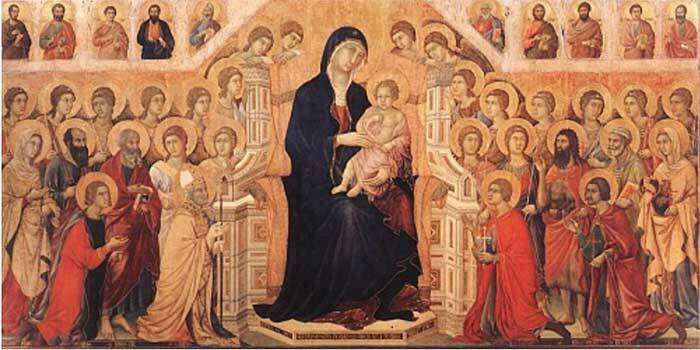 For the holy Church, that she may be a refuge for all people and a source of help in time of need. Let us pray to the Lord. 2. For our leaders, that they may effectively coordinate our efforts to relieve those in anguish and difficulty. Let us pray to the Lord. 3. For the poor and the homeless, that they may find comfort and shelter through the charity of Christ's faithful. Let us pray to the Lord. 4. For travelers and all who are caught up in the middle of the storm, that they may safely reach their home. Let us pray to the Lord. 5. For all of us gathered here, that we may trust in the Lord and support one another, especially in these difficult times. Let us pray to the Lord. source of strength and comfort for your people. for we put all our trust in you. I highly recommend this modern version of the Litany of the Saints by John D. Becker. It is my favorite, after the traditional Roman Chant, because of its musical simplicity which facilitates the participation of the assembly, its somber and meditative mood, and the amazing way the saints were grouped: Mary and Joseph together; the family of Abraham; Benedict and Scholastica; Ambrose, Augustine and Monica; Clare, Francis and Dominic. The list even includes great Old Testament figures and Origen, who are not usually mentioned in other versions. As their names are called, it is as if these brethren of every age are passing in procession; men and women who followed Christ together, telling their story again, inviting us to join in their glorious company. Particularly appropriate for baptism but may be adapted to suit other celebrations. Simply awe-inspiring! All ye holy men and women, pray for us. Priscilla and Aquila, pray for us. Linus, Cletus, and Clement, pray for us. Innocent and Boniface, pray for us. Cosmas and Damien, pray for us. John Chrysostom and Justin, pray for us. Louis and Wenceslaus, pray for us. Christ hear us, Lord Jesus hear our prayer. Lord give new life, hear our prayer. To his chosen, hear our prayer. Jesus, Son of the living God, hear our prayer. Today the Church honors Saint Benedict, the great Father of Western Monasticism. But for us who are living, not in monasteries but directly immersed in the world, what is his significance? The first lesson of Benedict is dissatisfaction. Benedict belonged to the Roman nobility and he had everything any of us would have wanted: intelligence, money, (good looks?) prestige. But having all these, Benedict's heart kept searching for something more, which made him turn to solitude where the 'still small voice' could be found. Benedict's heart rested not in the fleeting company of the world but yearned to be with God, who alone could satisfy his longing. The young Benedict went into a cave but soon enough, came out as a man of God. In the Prologue of his Rule, Benedict exhorts the aspiring monk, not to retreat but to take up arms for Christ. He himself founded twelve monasteries and wrote the Rule which up to now remains the principal source of monastic spirituality. Even when bound within the monastic walls, Benedict always sought to give glory to God; his battle cry: "Ut in omnibus glorificetur Deus"-that in all things God may be glorified. Although himself bound by the monastic vow of stability, Benedict was a man in constant flux. But even in the midst of his movement, even outside the solitude of the cave, Benedict maintained a profound stillness of spirit-peace which has since been his legacy. In the end, Benedict was not a man who fled the world to find God's home, but one who found a home for God in his heart while living amidst the world, even if only the world within the walls of his monastery, or if he were in our time and in our place, the hectic and complicated world we live in. The monastery is not a place of escape from the world. The true monastery is that home we share with God in our hearts where we can retreat at the end of the day and rest secure. On this feast of Saint Benedict, let us pray for his three gifts. May we always long for God in our lives and may our longing spur us on to give him glory in all that we do. Even amid the hustle and bustle of life, may we find a sanctuary for God in our hearts-an intimate and hidden dwelling where we can remain with him and find our peace. The Lord is good and steadfast in love! Alleluia! Gifting us all with this year of grace! Alleluia! People of God, rejoice and sing! All hail Ignatius’ founding eyes! Alleluia! Sharing God’s dream, a vision to guide! Alleluia! All hail Xavier’s burning heart! Alleluia! A passion to set the world on fire! Alleluia! All hail Faber’s gentle arms! Alleluia! A spirit of care to soothe and embrace! Alleluia! All hail them three, Companions of Christ! Alleluia! Sharing their vision, passion and care! Alleluia! Praise be to God, who gathers us in! Alleluia! Praise to the Son and Spirit of love! Alleluia! Saint John Mary Vianney, Curé of Ars. and the admirable fruitfulness of his ministry. he overcame all the obstacles on the way to priesthood. and the dynamism of his apostolic zeal. in unity and mutual love. like Saint John Mary Vianney. The words of Yahweh through the prophet Hosea, the striking words of Christ in today's Mass, ring out distinctively to us, lovers of liturgy: "It is mercy I desire, not sacrifice." The sacrifice of Christ on the Cross was not a mere upgrade of the temple holocausts, from rams and bullocks to human sacrifice. Rather, what made Christ's offering truly pleasing and perfect, the unique salvific element in the liturgy of Calvary, was love. Out of love, Christ submitted himself totally to the Father's will. Because of love, he laid down his life for our sakes. What truly redeems us is not the blood of sacrifice nor the death of Christ, which God does not desire in any way, but the self-sacrificing love of Christ. This love made him empty himself, empty himself even unto death, death on a cross! The true sacrifice of Christ is the sacrifice of Love. That is why we should always approach the altar with love. It is truly saddening when people get mad and even fight over the liturgy and during the liturgy. Where there is hatred and division, communion becomes mere externality and liturgy is reduced to a show where the essential thing is only to be flawless and perfect. But what is more important in worship is not the external perfection of performance but the interior disposition of love. Our every act in the liturgy, whether flawless or flawed, must necessarily come from a loving heart, or it will only be empty and meaningless. The true liturgy is the liturgy of Love. When we lift up the sacramental signs, we are not offering mere bread and wine. (What is God to do with bread and wine?) Rather, we are uniting ourselves with Christ as an offering to the Father, to be broken and shared to others. Hopefully, our participation in the sacrifice of Christ will make us persons who are more loving and capable of authentic sacrifice-no longer that of scapegoats and sin offerings, but of selfless self-giving after Christ's own example. At times, we can become lost in the externals of ritual. But we should never forget that love is the essence of authentic liturgy. Saint Maria Goretti is one of many modern saints whose testimony of life bears great significance for our times. One of the greatest praises said of her, and which perhaps sums up her true greatness, is that she dared to make 'love's bravest choice'. Her choice was not simply to die to keep her virginity-as she had very little to choose about that. While many of the early martyrs would have anticipated giving their lives for Christ, the moment of trial came for her as a surprise. But what made her choose to die rather than sin in the end was her fundamental choice to love Christ and to live the values of the Gospel no matter what it takes. Suddenly made to choose between living and sinning or dying to be faithful to her Beloved, her response was clear and simple, organic and spontaneous: "No, it's a sin! I will not do it!" It was a choice she has been making all this time and ultimately, she had but one choice to make: to give in to the irresistible demand of authentic love. In today's first reading, the king asks the prophet Amos to stop prophesying in Israel but he would not-he could not because he has committed himself as a servant of Yahweh, always to do and say whatever God bids him to even if the people and the powers that be do not approve of it and stand against it. In the Gospel, the scribes are criticizing Jesus for forgiving a paralytic but Jesus simply had all the confidence because he had always been living in the Father's love. In these times when the prevailing culture makes it very difficult for us to choose Christ, are we willing to commit to the values of the Kingdom? Are we brave enough to make the fundamental choice, the radical choice that transforms us in our very roots, to love Christ no matter what the cost? This fundamental choice will determine the small choices that we make daily. And when asked to make a choice, as urgent and sudden as the choice Maria Goretti was once asked to make, then we willl be able to make 'love's bravest choice' simply because of the love that has always been there. Today's first reading speaks of us, the Church, as being built on the foundation of the apostles. The Gospel reading on the other hand, opens with an apostle with a reluctant faith. Is this the foundation of the Church that we are speaking of? Our generation today most probably identifies well with Thomas' incredulity. We are a people who are looking, not only for signs, but for proofs as the foundation of our belief. Not a few fall out of faith, not only because they lack proofs of God's existence, but more often because they have run out of proofs of God's love in their lives. But Jesus today challenges us, not to look around for proofs but to look on him instead with the trusting eyes of faith that is able to see even in the darkness of doubt, desolation or despair. He invites the Thomases in us, with great gentleness and understanding, to dwell on his hands and his side, pierced and wounded for love of us, as the real proof of his love, more than on any petty or fantastic proofs of his existence in our lives, as the foundation of our faith. The Church builds indeed on a firm foundation, which is otherwise fragile if not for Jesus himself, the capstone who holds everything together and makes us grow in our littleness of faith to become a temple sacred to the Lord. Our faith too is weak and fragile, and so we always beg the Lord to strengthen and increase our faith. Before the Fraction, immediately following the Lord's Prayer with its accompanying embolism and doxology, we have the Rite of Peace. This is of ancient origin, that has maintained its place after the Eucharistic Prayer as early as the fifth century, so that there are three rites directly preceeding the giving of holy Communion: the Lord's Prayer, the Rite of Peace and the Fraction. 82. The Rite of Peace follows, by which the Church asks for peace and unity for herself and for the whole human family, and the faithful express to each other their ecclesial communion and mutual charity before communicating in the Sacrament. As for the sign of peace to be given, the manner is to be established by Conferences of Bishops in accordance with the culture and customs of the peoples. It is, however, appropriate that each person offer the sign of peace only to those who are nearest and in a sober manner. 1. When the Rite of Peace is overly extended and unduly prolonged. In our seminary for example, there is a custom of people embracing each other as a sign of peace, which is perfectly fine. The only thing is that, you do not have to embrace everybody but "only those who are nearest". The practice however is that the seminarians leave their pews and go out to embrace as many people as they can, defeating in effect also, the indication of sobriety in manner, so that most of the time, because of the undue emphasis, the connection of the rite to the reception of Communion is no longer clearly seen but instead, the sign value of "ecclesial communion and mutual charity" can be exaggerated and over-emphasized to the point that this rite, essentially linked to the Sacrament, seems like a distinct and essential rite in itself, and divorced from its essential significance. 2. Substituting secular forms for the liturgical form. The Roman Sacramentary leaves great freedom for discernment as to the manner the sign of peace is to be given. Before they have an elaborate embrace, usually familiar only to the clergy, (with such rules as to whose arms is over whose during the embrace). Now, the usual custom is to bow to one another and say 'Peace be with You' and in some places, to shake hands and embrace as well. Some priests however have a cute but sometimes irritating way of tweaking the usual form. They substitute such greetings as "Good morning, you look beautiful today" and "You are my angel" (there are far worse examples I could not recall as of now) in place of the words of peace that come from the Risen Lord himself. This seems part of the whole phenomenon of presiders turning into performers who are ever searching for ingenious ways to modify the liturgy to make it more novel (or to make themselves appear more cute). Much is lost however when this is done. First, the sacred character of the celebration, and indeed of this rite, is diminished, and turned into a tawdry expression of congeniality, that often fails to express the profound meaning of sharing the Lord's Peace instead of empty compliments that are cute but most the time we do not seriously mean. Again, the intimate connection of the rite with the reception of holy Communion is blurred. On the other hand, the very simple words 'Peace be with you' easily recalls the Resurrection appearances of Christ, when he shares a meal with his disciples. It even recalls that particular apparition when the apostle Thomas, who was not there the first time the Risen Lord came, was already present, and having seen and touched the Lord, exclaimed "My Lord and my God!" What we are supposed to be exchanding here as a sign of communion and fellowship are not mere casual greetings but the healing and transforming words of the Risen Lord himself, who alone gives true Peace, who is himself our Peace. Thus we are able to see with eyes of faith that we are truly Christ's Body, made One in our sharing the One Bread. Thus, with great faith, we are also able to exclaim, "My Lord and my God!" and recognize the presence of Christ among us. In Korea, the usual greeting, 'annyeong haseyo' is literally translated as 'Peace be with you'. The Korean bishops however, decided to substitute another greeting for liturgical use, instead of using this very casual, practically banal, secular greeting. I think we have something important to learn here. What is fundamental in liturgy is not to try too hard to be novel but to be creative in carrying out what is given-the potential of which remains largely unexplored.